Why are we talking about Scott Pruitt, Trump's embattled EPA chief? Who is Scott Pruitt, and why are we talking about him? Pruitt, 49, is currently the administrator of the Environmental Protection Agency (EPA). Before that, he was Oklahoma's attorney general and an adviser to the Trump campaign. At the EPA, Pruitt has made a name for himself by rolling back environmental regulations. This has made him popular among conservatives, and the right-leaning media often sings his praises. Liberals, however, see his zeal for deregulation as dangerous and note that he is a climate change skeptic. Still, Pruitt was narrowly confirmed to his current post in February 2017. Pruitt has been effective in his role at the EPA, and helped convince Mr. Trump to exit the Paris climate change agreement last year. Just this week, he announced that he would ease fuel efficiency standards set by the Obama administration for cars and trucks, although he did not specify what the changes would be. "Pruitt has spearheaded over two dozen regulatory reforms, with over a billion dollars in savings during his first year here at EPA, and all told, issued more deregulatory actions than any other federal agency under the Trump administration," the CEO of the National Automobile Association, Peter Welch, said when introducing Pruitt earlier this week at EPA headquarters. But now Pruitt finds himself in the midst of an ethics scandal, and his job may be in jeopardy as a result. What exactly is this ethics scandal? It started last month when it became known that Pruitt rented a room in a Capital Hill condo from February through the end of July 2017. The room cost him about $50 a night, or roughly $1,500 a month. Administration officials privately admit the terms of the rent were favorable, and Pruitt only spent $6,100 in rent, which is $2,150 less than someone paying that rent every night. Pruitt's daughter would also sometimes stay the night in the condo when he wasn't there and she was interning at the White House. An official told CBS News said Pruitt paid the rent for his daughter when she stayed there. The condo was also used sometimes for GOP fundraisers, a fact that an administration official said was because it was close to Capitol Hill and cheap compared to some other alternatives. When Pruitt once fell ill on the job, went home early, and was unreachable by his security detail, the detail broke into the condo. The EPA wound up paying $2,460 in damages for the incident, which was first reported by ABC News. EPA ethics officials signed off Pruitt's living arrangement. "As EPA career ethics officials stated in a memo, Administrator Pruitt's housing arrangement for both himself and family was not a gift and the lease was consistent with federal ethics regulations," EPA spokesman Jahan Wilcox told CBS News. Still, renting an apartment from the wife of an energy lobbyist isn't exactly a great look for the EPA administrator, and has raised eyebrows in Washington. Yes. Pruitt's landlord was Vicki Hart, and her husband is Steven Hart, a lobbyist who represents a number of energy concerns. Hart is the chairman and CEO of Williams and Jensen, which represents Exxon Mobil and Cheniere Energy, a liquefied natural gas exporter, among other energy companies. But a spokesman for Hart told CBS News that "describing Mr. Hart as an energy or EPA lobbyist during the Trump administration is false as he did not lobby the EPA or the [Department of Energy] in 2017 or 2018." So Hart didn't lobby Pruitt? Well, here's where things get tricky. According to the Associated Press, Pruitt and some EPA staffers spent $40,000 in public funds to travel to Morocco and encourage that country to import more liquefied natural gas from the U.S. And the only company currently exporting liquefied natural gas from the U.S. is Cheniere Energy, a Hart client that is also building a pipeline in Oklahoma. The AP also reports that in March 2017, Pruitt had a meeting with the CEO and vice president of OGE Energy, an electricity company. OGE Energy is another client of Hart's firm, and the meeting was facilitated by George Baker, a lobbyist who works for Hart and who was in attendance at the meeting. At the time, Pruitt was still renting the room from Hart's wife. Later that year, the EPA decided to rewrite an Obama-era regulation that affected the kind of power plants OGE operates. According to Open Secrets, OGE paid Hart's company $400,000 for lobbying in 2017, while Cheniere Energy paid $80,000. That seems a little sketchy? It does to Democratic lawmakers like Rep. Don Beyer, the top Democrat on the House oversight subcommittee that oversees the EPA. Beyer says that Pruitt "showed contempt for transparency, ethical guidelines and the public interest" and should resign or "be fired immediately." Florida Republican Reps. Carlos Curbelo and Illeana Ros-Leithan have also called on Pruitt to resign. And on Sunday, former New Jersey Gov. Chris Christie, a Republican who advised Mr. Trump's campaign, implied on ABC's "This Week" that Pruitt should go. This isn't the first time Pruitt has gotten in trouble since he became EPA chief, either. Like another current and former Trump cabinet officials, Pruitt has come under fire for travel expenses, including the $120,000 in taxpayer cash that was spent to fly him to Italy last summer. Pruitt is the first EPA administrator to have a full-time security detail, which cost more than $30,000 for the Italy trip alone. The EPA inspector general is currently reviewing Pruitt's 2017 travel. Pruitt justifies the added security because he says he has received numerous death threats. His security detail recommended that he sit toward the front of the planes he travels on so he could escape quickly if threatened, although he told CBS News' Major Garrett on "The Takeout" podcast earlier this year that he had asked that that recommendation be reviewed. "What I've told them going forward is this: There is a change occurring, you're going to accommodate the security threats as they exist, you're going to accommodate those in all ways, alternate ways, up to and including flying coach, and that is what's going to happen on my very next flight. So those things are happening right away," Pruitt said. Are there any other Pruitt-related scandals? There are, in fact. On Tuesday, The Atlantic reported that Pruitt requested substantial pay raises for two young political aides who had followed him from Oklahoma. According to the magazine, Pruitt needed the White House to sign off the raises, and when it didn't, he used an obscure provision of the Safe Drinking Water Act to get the pay hikes through anyway. In an interview that aired Wednesday on Fox News, Pruitt claimed that he did "not know that they got the pay raises until yesterday." 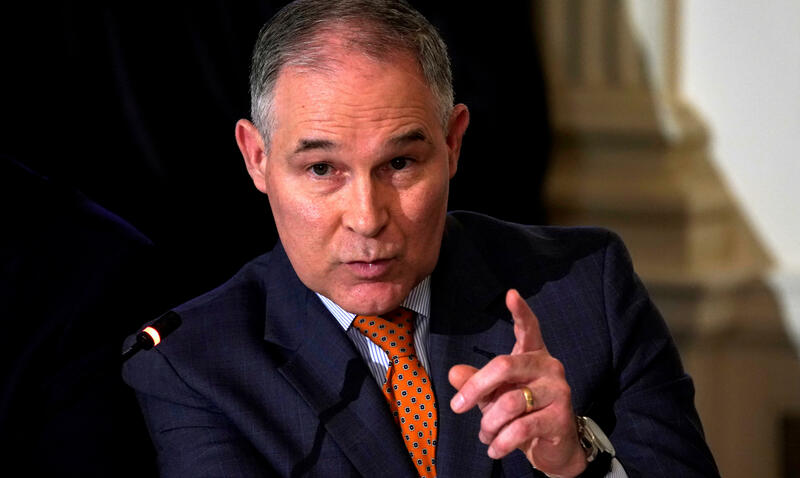 "I found out this yesterday and I corrected the action and we are in the process of finding out how it took place and correcting it," Pruitt also said, insisting that the pay raises were no longer in effect. How's the White House dealing with all this? President Trump and chief of staff John Kelly were both initially inclined to keep Pruitt and offered him words of encouragement. However, sources indicate that White House officials are growing wary of the situation and are disappointed with Pruitt's response so far. A White House source told CBS News that Pruitt will "probably survive" the spate of bad press but was surprised that the administrator did not grasp "that the appearance of impropriety is as bad as the real thing." But unlike some other recent departures from Mr. Trump's cabinet, such as now-former Veterans Affairs Secretary David Shulkin, Pruitt enjoys wide support from conservatives. Late last year, prominent conservative columnist and frequent Trump critic Kevin Williamson wrote a favorable profile of Pruitt for National Review. And earlier this week, The Federalist's Mollie Hemingway, who is also a Fox News contributor, warned that firing Pruitt would "utterly destroy conservative base morale." Mr. Trump is known to take the views of conservative media quite seriously when making his decisions. But the president is also sensitive to other kinds of bad press, and White House sources tell CBS News that they "are trying to figure out what's going on" with Pruitt's rental of the apartment, although no formal investigation has yet been launched. On Wednesday, White House Press Secretary Sarah Huckabee Sanders commended Pruitt on his performance but would not say that the president had confidence in the administrator. "We're reviewing the situation," Sanders told reporters at the White House briefing. Asked whether Mr. Trump still had confidence in Pruitt, Sanders replied that the president "thinks he's done a good job, particularly on the deregulation front, but again we take this seriously and we're looking into it."